When it came to the quest for the crystal skull - Indiana Jones should have stayed home and ordered these. It would have made for a much more satisfying experience than the movie did! Of course - we aren't the only people who think they are fabulous - so naturally - they are in short supply! We did manage to get some, and we suspect they will go fast. It will probably also take a while to restock, as other, less fortunate (and less connected!) bead stores have their orders filled. And wait till you see the inspiration coming on Sunday for one of these in a ring! Other goodies we have for you this week! Caving to constant nagging Due to popular request, we have the Miyuki Delica End Tubes. These are a highly specialized finding - but what they do - they do so well! 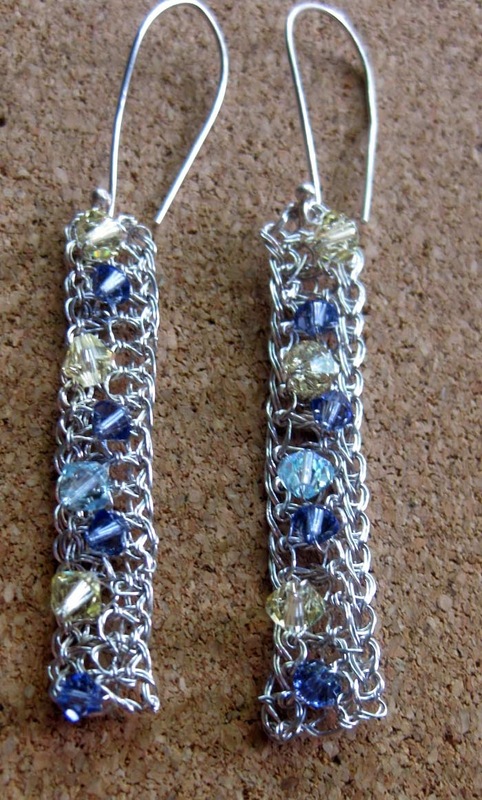 These are made by Miyuki for their seedbeads. Essentially, you slide the end row of beads of your loomed or square-stitch piece (Sorry, peyote folks. It needs a flat end row.) into the tube and it creates a beautiful, finished end. To use, just fold down the tab (sticking out bit) on one end and slide the end row of beads in, and then fold the other tab down to secure. Easy peasy beautiful! In other findings and component news! - we have they metal pendants that we called "Brimmed Crowns." These come in two pieces so that you can embellish the round disk by stamping it, and then add a bead or cabochon to the centre bezel, and assemble the two pieces for a finished pendant. The advantage of this is that there is no chance that you will damage the bezel or centre stone while you are whacking away with the hammer, and you have room to work without the centre decoration getting in the way. Brilliant, eh? We have quite a few other new items for stamping on too, so be sure and have a look! Also new, not quite so full of drama, but you are going to love them - base metal ball-headpins. Instead of the ball headpin just being a sterling silver item and the base metal headpins all being "nail head," now you have the option of the more elegant (IMHO) ball headpin. Two sizes of ball, three different lengths, three metal colours! And if you are feeling the need to seedbead - 24 more colours of size 11/0 Toho seedbeads - bringing the total of active colours to 431! Collect the whole set! All sorts of other new goodies too, so as always - you can click on a link or image above, or get started with the new items here. Happy Shopping! One day left - 20% off supplies that make you sparkle! On sale now! One day left! Save 20% now! Giovanna Paz has brought us a whole new way to crochet wire! 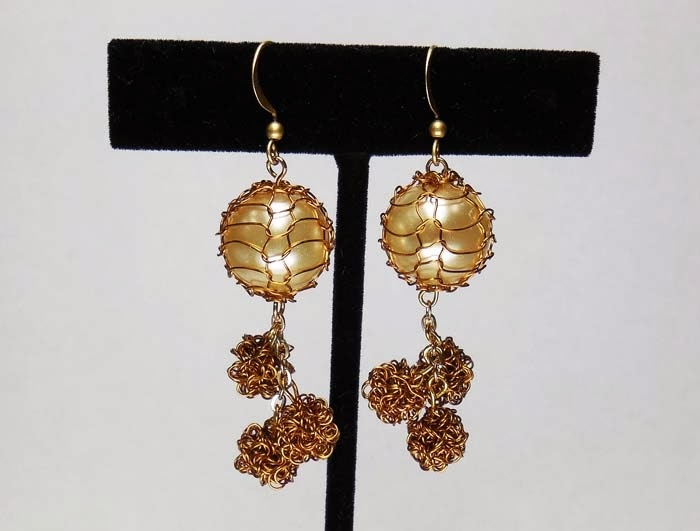 She has been teaching eager students Peruvian wire crochet to create amazing jewellery. Since childhood, Gio has been creating jewellery. "I loved to wear it; it was just a part of me," says Gio. "When I was in school I loved drawing. As a teenager I did lots of cross stitch. I used to make my own patterns and create pictures of infants and other designs for home decoration." "I learned my craft by taking several courses in Peru and then by playing around with various crochet patterns," explains Gio. 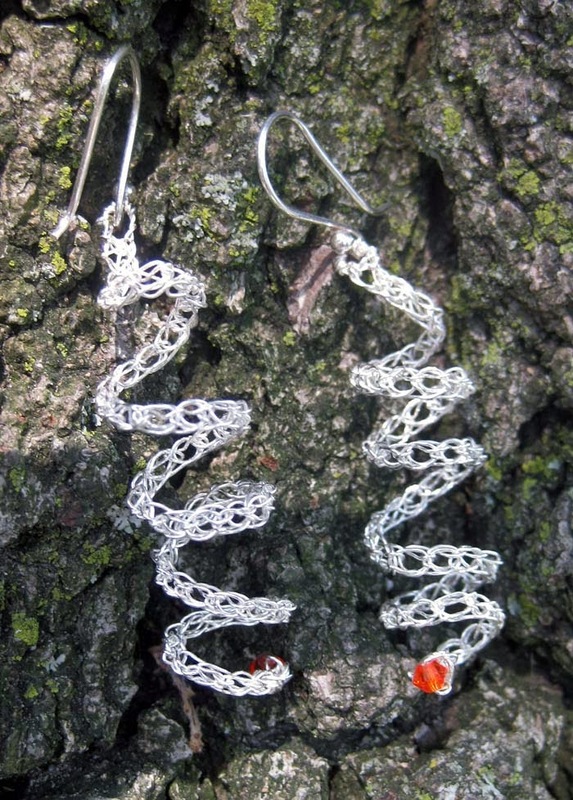 "That was the start of my passion for wire crochet." What inspires Gio? "Everything," she says enthusiastically! "I see a stone and my mind starts thinking about what to do with it. 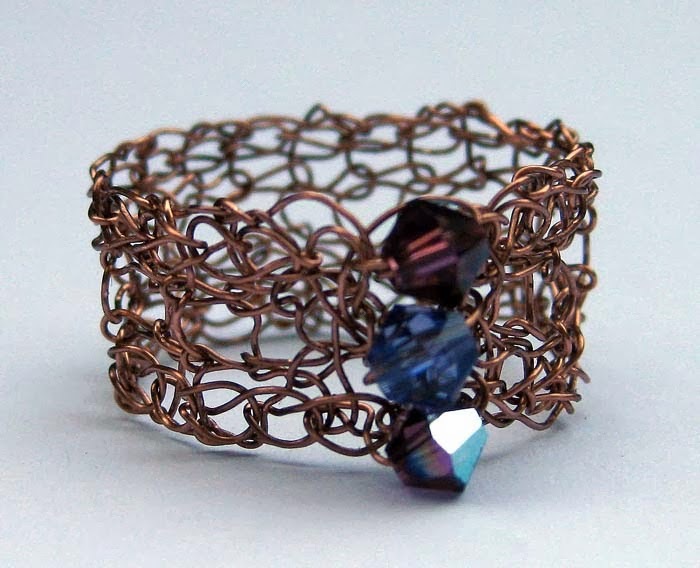 I love looking at images of jewellery on the internet and trying to apply wire crochet to the designs. Nature inspires me by the amazing colours it has to offer. Going shopping inspires me to want to create jewellery to match a new outfit. The universe is infinite with inspiration." Gio creates and decides on projects by following fashion trends and listening to her students. "I am always thinking ahead," she says. "I mix wire crochet techniques around my inspirations. There are days I simply spend designing new creations to teach. I also travel to Peru to go to small cities to learn more. I am always searching, collecting and creating wherever I go." Gio had other aspirations in jewellery making. "I tried to be a silversmith," states Gio. "I went to courses and - wow - I couldn't continue. The machines were too much. I used to cut my fingers all the time and I just gave up. 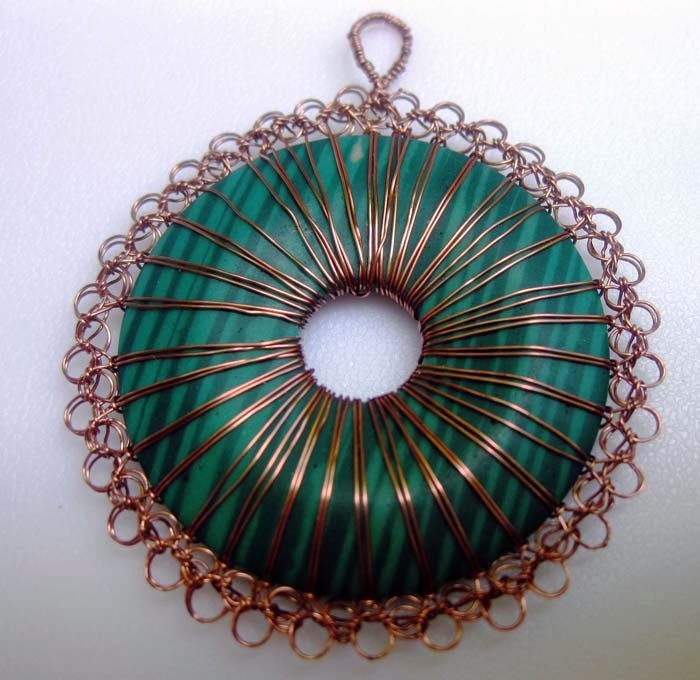 I didn't like the fact that I had to depend on machines to create jewellery; but, when I learned about wire crochet, my life was fixed! It was just wire and a crochet hook - no machines. I felt free and that is where I found my passion." Her favourite part about teaching? "The best part is when I see my students' happy faces ... the smiles! Then they write you and tell you that they are creating more, or they send photos - that makes me feel totally amazing!" In contrast, the least favourite part is the frustration that some students feel. "That is when I just focus on them," says Gio, "and explain that all artistic pieces take time and patience. In the end all is good." Her advice to others who create? "Work hard for your dreams and never give up," says Gio encouragingly. "Focus on what you create and know that each piece as unique, believing in yourself and your gift. Work, work, work rather than invest lots of money. Working hard is the only way you see results." Complete information about Gio's classes can be found on our website. Click on 'Classes' and follow the links to the appropriate month's classes. Here's a bangle to make you the belle of the ball. Slip on a stack of these babies and you will bedazzle the handsome prince, the entire royal family, and the palace guard to boot! Version A - the silver and aqua bracelet is a single row of cup chain - cut to length, and carefully glued into place. 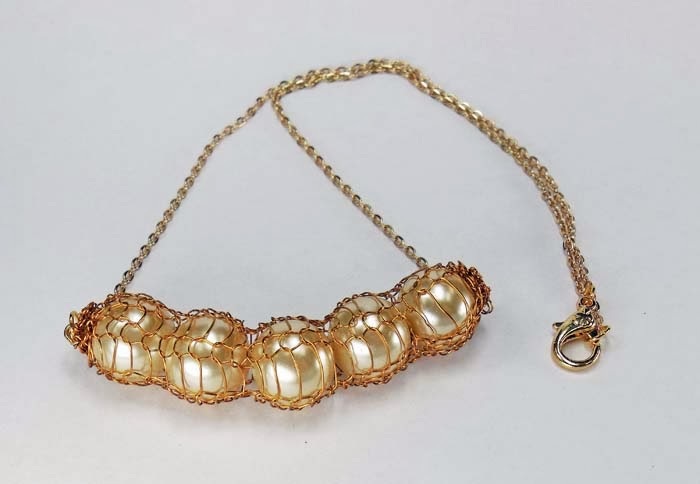 Version B - gold and Crystal AB - has additional rhinestones glued into place between the big stones of the cup chain. Glue the cup chain on first and wait for it to cure before adding the smaller stones. Either way - these are traffic stoppers for sure! No matter how beautiful your work is, if you don’t sell it, your business will fail. In a crafty business money is sometimes not the main reason we’re in business. We do this because we love it, because we want a creative outlet, because we want to share our talents. Regardless of why you are in business, if you lose money it’s a failure. The bottom line is you need to sell your work. There are 3 ways you can sell your work. There are advantages and disadvantages to each method. Each method isn’t mutually exclusive and most successful makers use a mix of all three. Let’s start with retailing your products directly to the public. You receive 100% of the final selling price and you receive this immediately. Cash is good. Wholesaling is when a store buys your jewellery outright. They order from your catalogue, you produce the work and they give you money. With consignment, the store doesn’t actually purchase your work. They agree to display it and sell it for you. When it sells, they send you money. This is advantageous to the store as they do not have to spend money on inventory. While most of us would prefer to sell only wholesale, most stores deal on consignment. In the beginning of your crafty career, you will find that you are obliged to deal with stores on consignment. more time in the studio, less time selling. How you choose to sell depends on a number of factors. If you know that you are not a people person and don’t like the general public then craft shows are not a good option. Selling online is much easier than it used to be, however it does require a minimum of computer literacy and a lot of time. If selling your work for 50% of the price means that you are losing money and you feel that you cannot raise your prices, then wholesale and consignment will not work for you. Think about how much time you want to spend in the studio rather than in a selling position, although if you want to sell wholesale or consignment you still have to sell, only this time to a store buyer. Sometimes it’s a loathing of selling that stops many crafters from moving forward with their business. Think of it not as selling, but as an exchange between friends. You are gifting them with your work, and they are gifting you with money. And you have made their world a more beautiful place, that’s fair. Have you ever paused to ponder why there are no yellow Firepolish Faceted Rounds? Why is that? Why is i t, when you reach for the happy yellow accent beads ... you come up short? That's not all for missing colours! Because we also discovered - Toasted Rose, Hydrangea, and Kiwi Opal. If that doesn't make you want to Kiss a Frog, I do n't know what will. All I can say is, Veni, Vidi, Verdigris. And speaking of discovery - we unburied a few more of our un-buried treasures. From the Temple of Doom to the Canals of Venice, you can use these beads to re-create and re-invent history. And speaking of history - how about a new colour of metal - one that evokes treasures from bygone days? These Red Bronze beads and findings have an old-world field with their warm, almost coppery looking goldy colour. We don't have a huge amount of it yet - so if you want jumprings to go with this, we suggest you use antiqued copper for now for the closest match. Wire Lace - the 2.5 mm width has been phased out by the manufacturer, and replaced with 3 mm. Yes - it's a subtle difference, I know, but there you have it. So the whole line of colours, now in 3 mm. Available now. As always - you can click on a link or image above, or get started with the new items here. Happy Hunting! Remember to stay warm! Shop online! Here at BeadFX, we attract lots of multicraft afficiandos: knitters, crocheters, sewers and quilters, just to name a few. Today is the last day of the 20% off Swarovski Hotfix sale and Kim Workman came in to take full advantage! Jan P Krentz wanted to brighten up the darker spots of the quilt. Actually, it was her son's idea, but who can refuse sparkle? Not I, and obviously, not Kim!! There are still two more layers to be made which will extend the quilt beyond its current 48"x48" size. 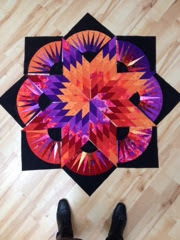 Crystal Volcano is the perfect choice for this quilt as it picks up the shades of purple, fucshia and orange. 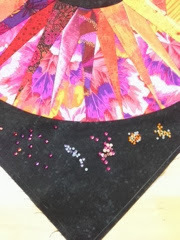 Kim has also decided to add in Swarovski hotfix in tanzanite, fucshia, sun and topaz. Kim promises to bring in the quilt once it's complete. 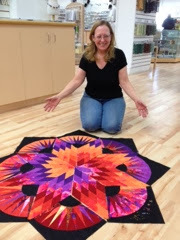 So far she has put in about 75 hours and expects to be quilting for at least another 150 hours!!! Just one day left to Prepare to Hot Fix all your Clothes! Let me tell you - 3 or 4 of these on a purse or a jacket - amazing! You can't say you are a dog person without puppy paws on your clothes - which you already have, I know, but these ones "sparkle." Celebrate the Craft of Jewellery Making in March! Just one day left! Headpins and Jumprings! Carol Cypher is coming to BeadFX! This week's sale: 20% on Headpins and Jumprings! The Business Chat - Go ahead, say it, I dare you.